Galaxies / M31 - The Andromeda "Nebula"
M31 is the famous Andromeda galaxy, our nearest large neighbor galaxy, forming the Local Group of galaxies together with its companions (including M32 and M110, two bright dwarf elliptical galaxies), our Milky Way and its companions, M33, and others. Visible to the naked eye even under moderate conditions, this object was known as the "little cloud" to the Persian astronomer Abd-al-Rahman Al-Sufi, who described and depicted it in 964 AD in his Book of Fixed Stars: It must have been observed by and commonly known to Persian astronomers at Isfahan as early as 905 AD, or earlier. R.H. Allen (1899/1963) reports that it was also appeared on a Dutch starmap of 1500. Charles Messier, who cataloged it on August 3, 1764, was obviously unaware of these early reports, and ascribed its discovery to Simon Marius, who was the first to give a telescopic description in 1612, but (according to R.H. Allen) didn't claim its discovery. Unaware of both Al Sufi's and Marius' discovery, Giovanni Batista Hodierna independently rediscovered this object before 1654. Edmond Halley, however, in his 1716 treat of "Nebulae", accounts the discovery of this "nebula" to the French astronomer Bullialdus (Ismail Bouillaud), who observed it in 1661; but Bullialdus mentions that it had been seen 150 years earlier (in the early 1500s) by some anonymous astronomer (R.H. Allen, 1899/1963). It was long believed that the "Great Andromeda Nebula" was one of the nearest nebulae. William Herschel believed, wrongly of course, that its distance would "not exceed 2000 times the distance of Sirius" (17,000 light years); nevertheless, he viewed it at the nearest "island universe" like our Milky Way which he assumed to be a disk of 850 times the distance of Sirius in diameter, and of a thickness of 155 times that distance. It was William Huggins, the pioneer of spectroscopy, who noted in 1864 the difference between gaseous nebula with their line spectra and those "nebulae" with star-like, continuous spectra, which we now know as galaxies, and found a continuous spectrum for M31 (Huggins and Miller 1864). Some of the features mentioned above are also of interest for the amateur: Even Charles Messier found its two brightest companions, M32 and M110 which are visible in binoculars and conspicuous in small telescopes, and created a drawing of all three. These two relatively bright and relatively close companions are visible in many photos of M31, including the one in this page. They are only the brightest of a "swarm" of smaller companions which surround the Andromeda Galaxy, and form a subgroup of the Local Group. The Andromeda Galaxy is in notable interaction with its companion M32, which is apparently responsible for a considerable amount of disturbance in the spiral structure of M31. The arms of neutral hydrogen are displaced from those consisted of stars by 4000 light years, and cannot be continuously followed in the area closest to its smaller neighbor. Computer simulations have shown that the disturbances can be modeled by a recent close encounter with a small companion of the mass of M32. Very probably, M32 has also suffered from this encounter by losing many stars which are now spread in Andromeda's halo. Under "normal" viewing conditions, the apparent size of the visible Andromeda Galaxy is about 3 x 1 degrees (our accurate value, given above, is 178x63 arc minutes, while NED gives 190x60'). Careful estimates of its angular diameter, performed with 2-inch binoculars, by the French astronomer Robert Jonckhere in 1952-1953, revealed an extension of 5.2 times 1.1 degrees (reported by Mallas), corresponding to a disk diameter of over 250,000 light years at its distance of 2.9 million light years, so that this galaxy is more than double as large as our own Milky Way galaxy ! Its mass was estimated at 300 to 400 billion times that of the sun. Compared to the newer estimates for our Milky Way galaxy, this is considerably less than the mass of our galaxy, implying that the Milky Way may be much denser than M31. 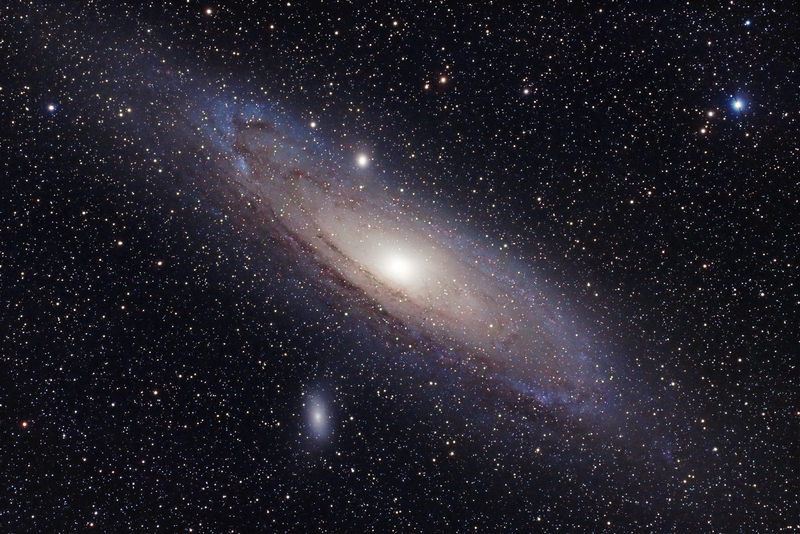 These results are confirmed by new estimates of the total halo masses, which turn out to be about 1.23 trillion solar masses for M31, compared to 1.9 trillion for the Milky Way (Evans and Wilkinson, 2000). The Hubble Space Telescope has revealed that the Andromeda galaxy M31 has a double nucleus. This suggests that either it has actually two bright nuclei, probably because it has "eaten" a smaller galaxy which once intruded its core, or parts of its only one core are obscured by dark material, probably dust. In the first case, this second nucleus may be a remainder of a possibly violent dynamical encountering event in the earlier history of the Local Group. In the second case, the duplicity of Andromeda's nucleus would be an illusion causes by a dark dust cloud obstructing parts of a single nucleus in the center of M31. Object description credit, with thanks, goes to SEDS.